On a cold winter's night, an old beggar woman sought sanctuary in the warmth of a beautiful castle, but is denied entry by the Prince. This woman turned out to be a beautiful enchantress, who upon seeing that there was no love in his heart, transformed him into a hideous Beast as befitting his dark heart. For years the Beast lived in isolation and despair, for the curse could only be broken if he learned to love another, and could earn that love in return before the last petal of an enchanted rose falls. Years later, a beautiful woman named Belle stumbled upon the castle and learned to love him regardless of his monstrous form. However, the Beast's happiness was cut short when his world became ravaged by the Heartless, and his beloved Belle was taken into captivity. Although the Beast was supposed to fade into darkness, his strong heart and his unwavering love for Belle illuminated the path for him to reach her, eventually reaching Hollow Bastion without the aid of an aircraft. The Beast's determination to save Belle, even when he was severely injured by Riku, gave strength to Sora, who at that time suffered a crisis of faith following the revelation that he was not the true Keyblade Wielder. The Beast became a powerful ally, lending his strength as a party member to the then weaponless Sora for the duration of that world. Though Hollow Bastion became infested with the Heartless following the opening of the Final Keyhole, the Beast opted to remain behind as long as Belle was still encased in glass and crystal, and rejected Sora's offer to flee to Traverse Town. When Sora returned to Hollow Bastion, the Beast was finally reunited with Belle in the Library. 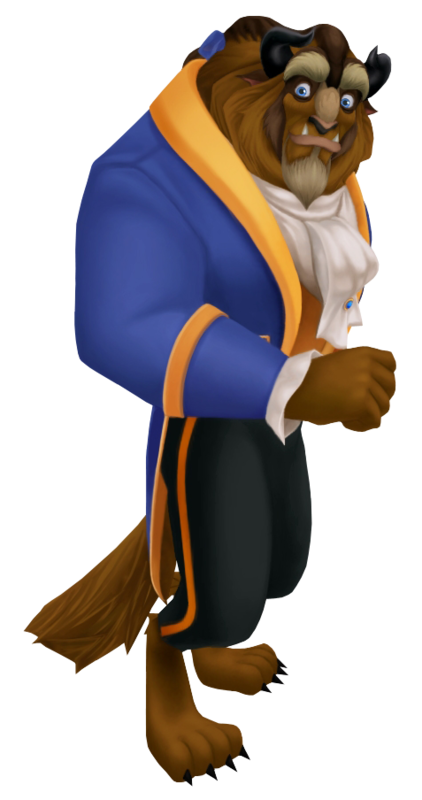 He consented to allow Belle to continue helping the other Princesses to hold back the darkness, and continued to help Sora in battle. He and Belle eventually returned home once Kingdom Hearts was sealed. A spoiled prince whose cold and selfish heart incured the wrath of a powerful Enchantress, the Beast was cursed into monstrous form as punishment. Unless the Beast learns to love another, and earn that love in return before the last petal of his enchanted rose falls, the spell will never be broken. Believing that no woman would ever love a monster, the Beast fell into despair and lived out his life in his gloomy castle. Ten years later, his pain and suffering was slowly healed due to the arrival of Belle, a young woman who was able to look past his hideous exterior and fell in love with him. When his world fell into darkness and Belle kidnapped due to her status as a Princess of Heart, the Beast overcame all odds to find and rescue Belle from her prison in Hollow Bastion. The Beast forged a deep friendship with Sora, Donald and Goofy, assisting them in the war against evil until the sealing of Kingdom Hearts. A year later, the Beast and Belle attempt to return to their normal lives in the castle, only for the peace to be interrupted by the Organization member, Xaldin. Sensing that the Beast's strong heart would prove to be an invaluable weapon, Xaldin poisoned Beast's mind against Belle and his castle servants in the hopes of turning him into a Heartless. As the Beast descended into darkness, he began to believe that Belle is conspiring against him and became obssessive over his rose. Fortunately, the Beast is able to fight against Xaldin's influence thanks to the help of his friends, and finds the courage to apologize to Belle for his distant behaviour for the past few months. Fate however is adamant in denying the Beast a happy ending. Xaldin reappears in the castle once more to kidnap both Belle and the enchanted rose with the intention of giving the Beast one final push into darkness . Although the Beast is forced to choose between his two greatest loves, true love ultimately prevails. A final confrontation seals Xaldin's death and prevents the Beast from losing both. Free of the guilt of past sins, the Beast is free to further his relationship with Belle. What was once a handsome, selfish prince became a wicked and horrid beast due to an enchantment placed by an unsuspected visitor in the night. The Beast has become milder and kind since he and Belle have returned but he still must have her fall in love with him in order to break the spell. He is obviously discouraged because "who could ever love a beast"? During 358/2 Days, the Beast cannot devote attention to Belle because Heartless and a few visitors have come to the castle without an invitation.